It’s Not Me, It’s the Basket Fairy! 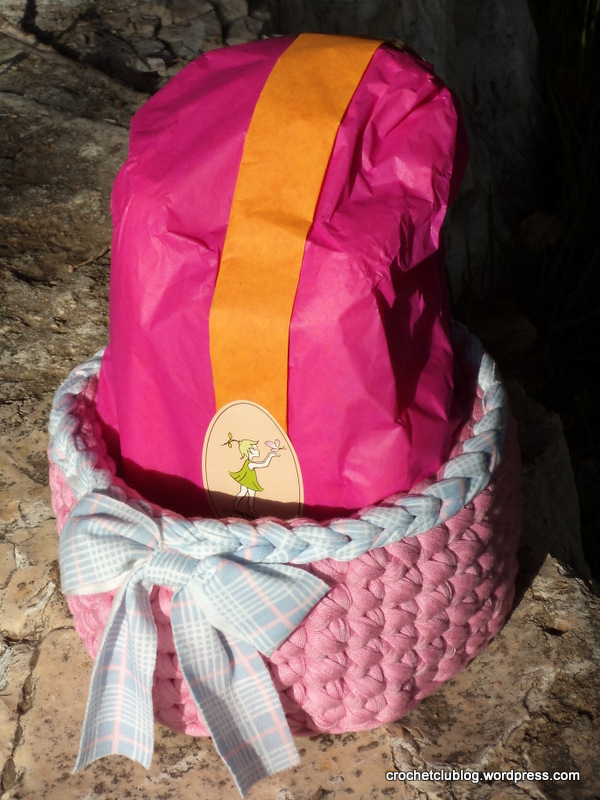 Yes, I know I’ve already made lots of baskets, even one or two pretty much like this one, but can I help it if I go out to the garden and find a cute pink basket just sitting in the geraniums waiting to be picked up? And can I help it if it’s just the right size for the baby gift I wanted to give my friends, and it even complements it in color? And can I help it if the baby who got it just loved it? 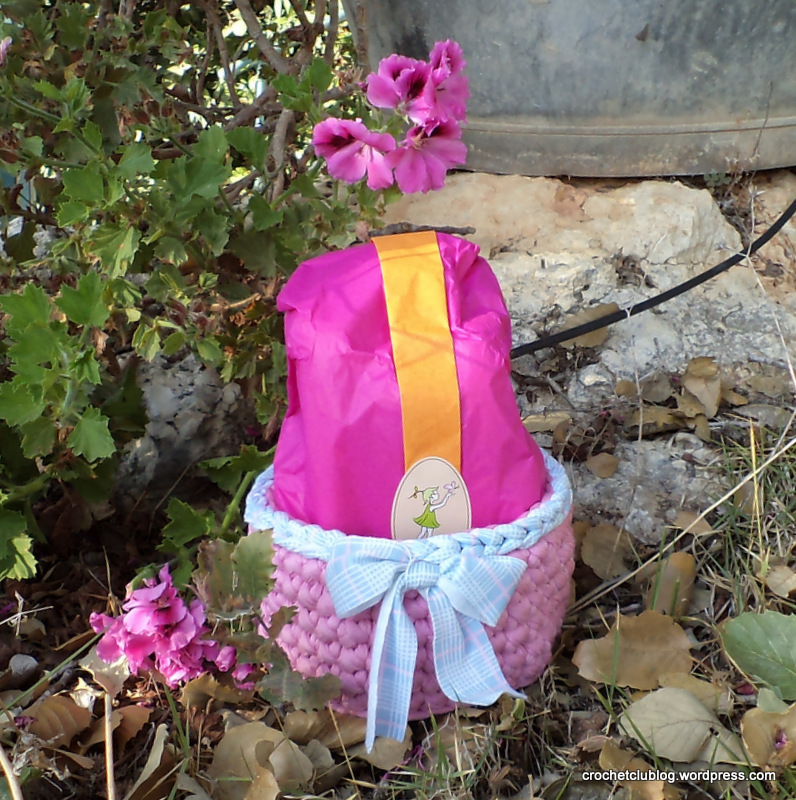 It’s the Basket Fairy, hovering over, finding the right moment to leave a soft, squeezable, colorful little gift where I least expect it. What would you do? How I Made the Basket: The same way as always… A size 12 hook and medium-wide, slightly stretchy, but not too stretchy, fabric yarn. Start with a magic circle and crochet a spiral base (or just a round base) in yarn under single crochet. Finish off with an invisible join. Start row 1 anywhere, crocheting into back loops only in YUSC. At the end of row 1, slip stitch into first stitch, chain 1, and continue stitching the next rows the same way. When you have reached the desired height, finish off with an invisible join. To make the trim, I used a complementary strand of fabric yarn. Place the basket facing you so that the part where you made the slip stitches to finish off the rows is in the far back. Now insert the hook into the back loop of the stitch in the middle of the top row (facing you ) to make a slip stitch, leaving a generous tail for the bow later on. Slip stitch into every stitch thereafter, into back loop only, till you have reached the stitch before the one you drew the strand from. Finish off with an invisible join. Cut the strand, leaving a tail the same length as the first one. You now have 2 tails on the inside of the basket. Draw each of the tails to the outside of the basket, using the spaces between double crochet stitches of the last row of the basket, with one dc stitch between them, and tie them in a bow. 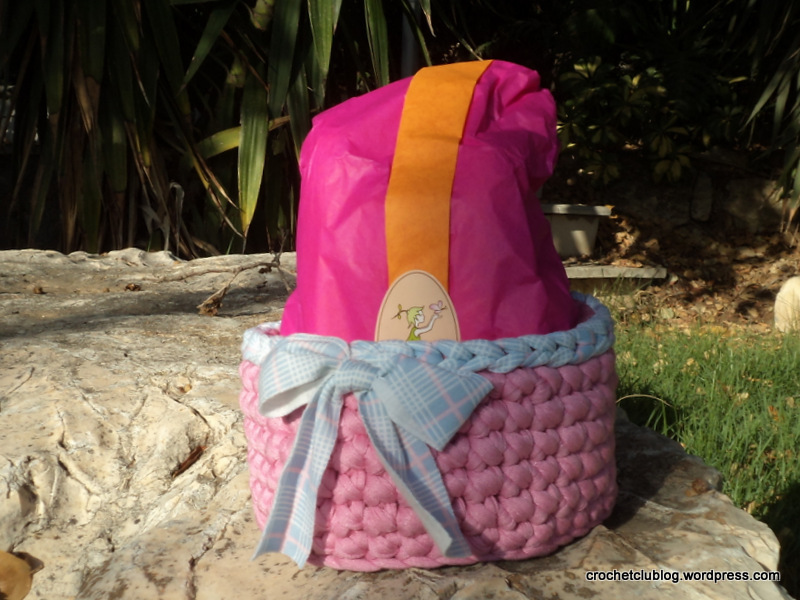 This entry was posted in Projects and tagged basket, bowl, crochet, fabric yarn, t-shirt yarn, tarn, textile yarn, trapillo, yarn under single crochet, סריגה בטריקו on September 7, 2015 by The Basket Fairy.